WLTA Twinning Week was once again a great success. We held our Twinning Week from 2nd - 10th April with 33 persons including the coach driver, all from the Lahnau area, coming to stay in Wincanton. They arrived safely on Good Friday after getting caught up in the Sea France workers' strike, two hours later than planned at 6:45pm. 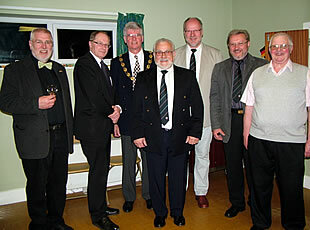 The week was to be made up of a very varied programme of trips out and the Civic Event which is always held during each week either here in Wincanton or in Lahnau. Saturday and Sunday were to be free days with the host families where they get to know one another and the hosts can take the visitors out and about where they would like to show them. On the Saturday Sherborne Abbey seemed to be the "in" place, as whilst we took our friends there so did four other hosts and we all seemed to meet in the one place simultaneously! On Saturday morning there was an invitation to all our visitors to come to the Museum to see the Mayor, Councillor Richard D'Arcy, present a certificate to John Atkins, the curator, for 20 years service to the museum. Many of them attended and after this presentation they all enjoyed a complimentary drink and biscuits. Monday and the first of the arranged trips left Wincanton at 10.00am to get to Hengistbury Head, where they all enjoyed a long coastal walk by the sea, something they all enjoyed as they are such a long way from the sea where they live. We can always be sure this will be a good trip to arrange. On Tuesday they once again headed off at 10.30am, this time to Cheddar to see the gorge, caves or whatever they wished to do. Many bought Cheddar Cheese to take back home with them as it is a novelty to buy cheese in Cheddar. Those who were feeling really fit left the coach at the top of the gorge and walked into Cheddar, with Ralph Bufton leading the way. In the evening it was time for the Town Council to shine and the Civic Evening was held in the Town Council's newly-acquired hall by the Recreation ground. 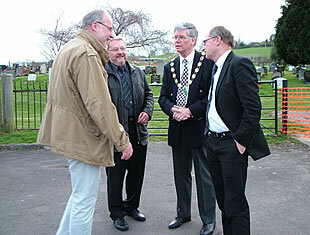 The first picture shows Mayor Richard D'Arcy ad District Councillor Tim Carroll greeting the arrival of the Burgermiester from Lahnau, Eckhard Shultz, who was on his first ever trip to Wincanton, accompanied by his secretary Klaus Koger. This evening was a great success and the food, which was plentiful and enjoyed by all was overseen by Yvonne Rogers, our Treasurer. In the other picture from left to right are, Karlheinz Bindemann (Vice Chairman Lahnau), Tim Carroll (District Councillor), Richard D'Arcy (Mayor), Rudi Tonigold (Chairman Lahnau), Eckhard Schultz (Burgemiester Lahnau), Klaus Koger (Secretary) and Phil Rodgers (Chairman WLTA). During the evening Richard D'Arcy presented a silver salver to Eckhard Schultz to mark his visit to Wincanton and he in return presented a plaque to Phil Rodgers marking his 19 years of involvement with the Twinning Association. Next year it will be the 20th year of the Official Twinning. Wednesday and a day of Historical Culture, as at 9.00am we all boarded the coach to Windsor, a trip requested by many of our visitors over the last few years. We arrived in time to see the changing of the guard - such a bonus for them to see this. Although we arrived to rain and grey sky we all had the most enjoyable time and a group of 34 of us went into the Castle for a most enjoyable two-hour tour. This then left some time to have a bite to eat, some shopping or a walk by the river. At 4.00pm we all met back at the coach where the driver, Udo, made us all tea or coffee and we ate some of the cake left from the evening before. We left Windsor at 4:30pm for the homeward trip in the sunshine. 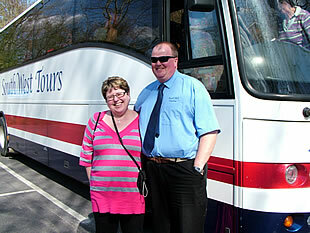 Thursday and the weather is good and we have a Mystery Trip today in Dorset. At 9.00am we left the Memorial Hall car park all expectant as to where we would go and what we would see. Gary and Elaine Rodgers have prepared today's adventure for us. 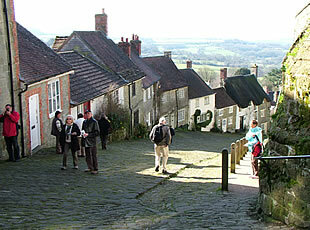 First it was off to Shaftesbury to see Gold Hill and Abbey Walk and stop for a coffee break if needed. Then it was a very short drive to the Mechanical Music Museum which I have to admit I never knew existed. It is a small museum of restored fairground organs all in working order and owned by Mr Hine who inherited them from his father. It was a very interesting and enjoyable hour we spent here, listening to the history and music of these wonderful machines. We then headed off through the countryside to Wimborne for a lunch stop and a look around, visit the Minster or shops. After Wimborne we headed off again through the winding country lanes to Tolpuddle and the small museum dedicated to the Tolpuddle Martyrs. A very interesting museum, there was also time to wander through the village, to the tree and church - all connected with the martyrs. Next we all boarded the coach again to head for Dorchester, Poundbury and then into West Bay for an ice cream stop and one more look at the sea which they all so enjoy. It was a lovely evening and most walked up to the sea front for ice creams and a walk by the sea. Then we left West Bay, back through Bridport and Beaminster to Yeovil for our last stop of the day where we all enjoyed a Fish & Chip supper in Palmers. All the time we were travelling Elaine was giving out many facts and figures of the places we saw and went through. It was a thoroughly enjoyable day. Friday and our last day together. We decided to take them to Dobies Garden Centre, Shepton Mallet, for a look around and coffee stop before heading into Street for any last minute shopping. The week went by very quickly and as well as all the above events and trips, many hosts held individual evenings of food, fun and laughter with other hosts. A very good time was had by all and we must also say very special thanks to Udo, the coach driver from Germany, who did a wonderful job driving to all the places except the Mystery Trip. Anybody who wishes to join the Twinning Association can do so by contacting either myself the secretary or Phil Rodgers the Chairman. We are planning to go back next year to Germany at the end of May Bank Holiday and it will also be our 20th Anniversary year.